Russia, it seems, was ready to sell. They had just lost an expensive war with Britain and France (Crimean War 1853-1855). They needed to raise money or make some serious cuts in spending. Talk turned to selling Russian America. When they looked back at their 100-plus years of ownership, what had they really gained? They even had a buyer in mind. In 1857, the Czar's brother made the push to sell the region to the United States. He argued that the United States already controlled most of the Pacific Coast. They would surely want to expand to the north to fulfill their manifest destiny. But talks ended when the American Civil War started in 1861. When the war ended, the Russians didn't wait long to try again. In 1866, Czar Alexander II told his ambassador to Washington, Baron Edouard de Stoeckl, to talk with U.S. Secretary of State William H. Seward about the deal. 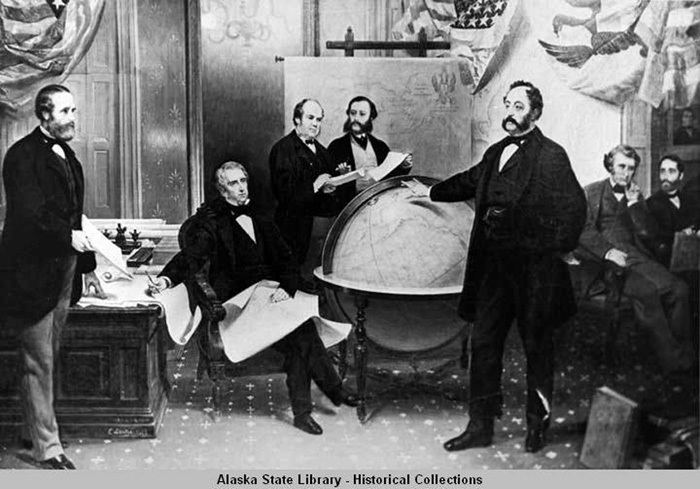 Seward was a big supporter of America's manifest destiny, the idea that the nation had a God-given mission to control the entire Pacific Coast. No one seemed to think about talking with the Native people who had lived there long before the Russians. Seward was eager to buy. They quickly agreed on a price of $7.2 million, about two cents an acre. As it turned out, the Czar would have agreed to $5 million, but Stoeckl was a smart bargainer. He was also a sharp politician. He spread lots of money among Washington's powerful politicians to help the process. It seems his effort paid off. The U.S. Senate quickly approved the treaty on April 4, 1867. But it passed by only one vote. The treaty may have passed quickly but debate wasn't over. As American troops took over the colonial capital of Sitka in October 1867, the press and some members of Congress raised questions about the purchase. Angry editorials called the land worthless. They said anyone who would want to live there was crazy. Many made fun of the deal, calling it Seward's folly, or Seward's icebox. Not everyone agreed with the critics. Seward's defenders were sure he had struck a great bargain. Gold fever was high after the California rush, and many believed -- or wanted to believe -- that Alaska would hold more treasure. The truth was few Americans knew much about the land. Even the Russians, who had been in Alaska for a century, didn't know much. The Russians had discovered small amounts of gold on the Kenai Peninsula in the 1850s, but they had never explored much of the Interior. Even Baranof Island, the site of Russia's colonial capital, had not been completely mapped. There was little solid proof that Seward had made a good deal. It would take decades to learn Alaska's true value. One vote does make a difference.